Now that we had beans grow­ing on the vines, we need­ed to know how to make them into vanil­la. In our research, we found there were a small num­ber of arti­cles and pub­li­ca­tions dis­cussing ways to cure the pods, but they were all either descrip­tions of the tra­di­tion­al “bour­bon” method or meth­ods suit­able for indus­tri­al-scale cur­ing. Interesting infor­ma­tion, to be sure, but none of it was some­thing we could do exact­ly as described. When it came time to cure the beans from our first har­vest, we looked at sev­er­al cur­ing meth­ods. The bour­bon method is slow and labo­ri­ous, but the qual­i­ty of it’s results are well-known and it’s an accept­ed stan­dard. Several alter­na­tive meth­ods have been devel­oped, but the bour­bon method is pre­ferred, espe­cial­ly for the whole-bean trade. The prob­lem with the bour­bon method is that I didn’t think it would work here due to the cli­mate. The vanil­la har­vest sea­son is February-April and Kauai tends to be cool and wet at that time of year. The Bourbon method calls for peri­ods of out­door dry­ing to raise the tem­per­a­ture of the beans then they are packed into insu­lat­ing blan­kets and into a box where they “sweat.” This sweat­ing process is the most impor­tant part of the cur­ing process in devel­op­ing the full aro­ma and fla­vor of vanil­la. This isn’t going to work on Kauai, it’s real­ly just not warm enough, and cer­tain­ly not dry enough. Our solu­tion is to use an insu­lat­ed box with hot water bot­tles to keep it warm while the beans are sweat­ing. For the dry­ing, the beans are placed under cov­er in the open air. I have a dry­ing rack on the roof that I use for this pur­pose. The roof is a good loca­tion for this because at night, mois­ture comes up from the ground, so being far away from the ground gives you low­er humid­i­ty. It’s also fur­ther away from crit­ters, which nor­mal­ly are not inter­est­ed in vanil­la, but still you don’t want them around where you’re try­ing to cure the vanil­la. After sev­er­al years of exper­i­men­ta­tion and expe­ri­ence, we’ve devel­oped what we think is the best way of cur­ing the vanil­la pods we grow here. 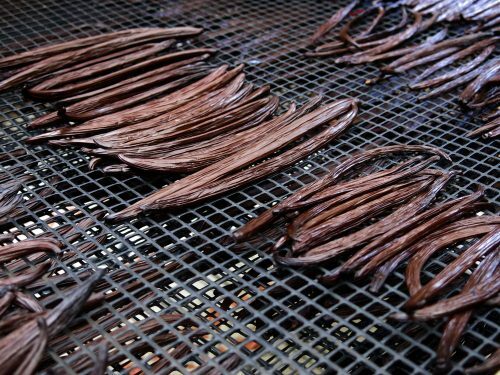 Our process is simple and not too different from how it is practiced throughout the Pacific where vanilla is grown. First, we pick the beans at the peak of ripeness: this is crit­i­cal because the last few days of ripen­ing brings a big increase the the pres­ence of glu­co­v­anillins, which are the pre­cur­sors to vanillin and oth­er aro­mat­ic phy­to­chem­i­cals. You want this to be at it’s max­i­mum, but before the pod begins to open. The beans cure up bet­ter before they have opened, and the qual­i­ty stan­dard for Grade A beans requires they not be split. Next, the beans are scald­ed in hot water to stop the devel­op­ment of the pod. If you didn’t do this, the pod would con­tin­ue to ripen and split as you try to cure it. 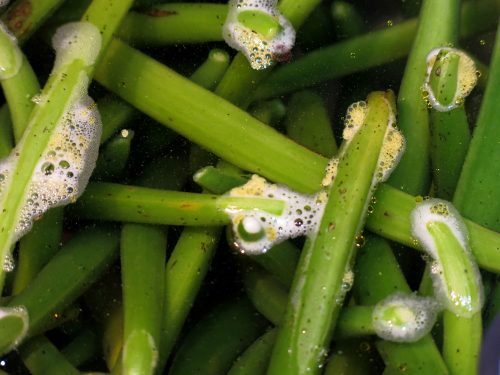 The scald­ing also opens up the cell walls in the pod so that the need­ed enzymes will be released and the hydrol­y­sis can begin. Hydrolysis is the chem­i­cal process that devel­ops the vanillin and oth­er aro­mat­ics in the bean. Once the beans have been scald­ed, they are wrapped in plas­tic and placed in the warm sweat­ing box. They sweat like this for 48 hours, and then they are brought out for a cou­ple of hours to dry down a lit­tle. The dry­ing needs to take place very slow­ly so the hydrol­y­sis has time to do its work, but not so slow­ly that the pods begin to rot. It’s often said that this cur­ing process is a kind of fer­men­ta­tion, but that is not strict­ly true: it is an enzy­mat­ic process. There are no inoc­u­lants used, nor is an active cul­ture of any kind encour­aged to grow dur­ing the cur­ing process. Because of this, oth­er organ­isms can take up res­i­dence, so low­er­ing the mois­ture lev­el helps keep that from hap­pen­ing. The sweat­ing takes place over a 15-day peri­od, dur­ing which the beans are moved twice a day: from the box to the dry­ing rack and back. That’s a lot of labor when you think about this hap­pen­ing every day for 3 months: it’s a con­tin­u­ous process because we are bring­ing in har­vests 2 or 3 times a week as the pods ripen. After the sweat­ing peri­od, the pods are put out to air dry until they reach the tar­get mois­ture lev­el. This can take any­where from 10 days to 6 weeks for a large, fat pod. The tar­get mois­ture lev­el is 30% or 20%, depend­ing on whether it is going to be a grade A bean or grade B. You know before­hand because the grade A beans are the largest, most intact beans with no defor­mi­ties. We also gen­er­ate an “extract” grade bean that is not sold in whole form, but is just made into extract. These are deeply split or mis­shapen beans that couldn’t be sold oth­er­wise. After air dry­ing, the beans are vac­u­um-sealed and stored for at least 2 months for con­di­tion­ing. After that, they are repack­aged for sale or made into extract. In the next chap­ter, I will talk a lit­tle about how vanil­la cul­ture is prac­ticed here. We have our own take on that, too, and there’s good and bad.